This week sees the releases of two new Gambit Prime Maps, the Thorn Exotic quest and the Allegiance quest. Ultimately, you’ll need to choose where your loyalties lie between The Drifter and the Vanguard, and your choice will have ramifications for future Destiny 2 story missions. We’re going to take a look at both branches to help you make the best decision. Alternatively, you could just go with your gut and wing it – I’m not your mum. There are 12 steps to each branch, so prepare to do a bit of grinding. You’ll be rewarded with a loot package and some tasty lore for your efforts. 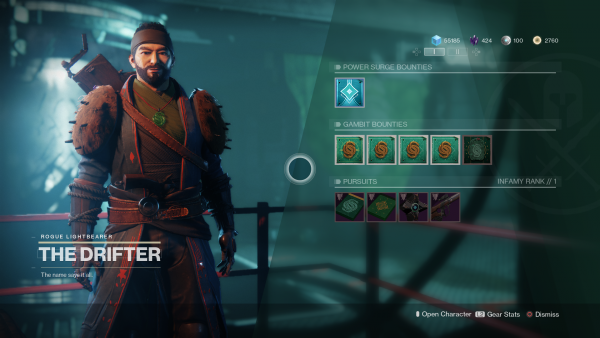 You may have noticed items drop at the start of Season of the Drifter from Aunor Mahal, and the accompanying lore. The Drifter has been anointing faux Dredgen by means of his Gambit scam, and the Praxic Order isn’t one bit pleased. Archiving these messages goes towards a Triumph and some of the best lore we’ve had in Destiny 2 since launch. These messages give a bit of backstory to the Allegiance quest and may help you choose a side. To unlock this quest, you must have completed the first few Gambit Prime and The Reckoning quest steps up until the point you have collected a Tier 1 piece of armour. That is, you have deposited a Weak Mote into The Reckoning Mote bank and successfully completed a run, winning yourself a piece of armour for Gambit Prime. Once you’ve spoken to The Drifter after doing this, you’ll unlock the Decision Point and can choose your side. The first step in The Drifter branch is pretty straightforward. The Drifter asks you to pay Spider a visit in the Tangled Shore, where you’ll need to purchase some Jerky. It costs 50,000 Glimmer, so you may need to find a few chests and explore a Lost Sector or two if you don’t have enough. Far from being a pork product, this item is used to locate a transponder on Titan. Once you arrived on Titan, complete a Heroic version of the Thief of Thieves adventure. After that, head back to the Annex. The Drifter then mentions that an old enemy, Shin Malphur, is in the EDZ somewhere. So, naturally, you need to head to the Crucible to defeat 25 Guardians to show off your strength. The next step is to head into Gambit or Gambit Prime and bank 50 Motes, which should be easy enough to complete. Once you’ve banked those Motes, it’s time to do a few Strikes. You’re looking to collect meat and fuel from Cabal and Vex Strike bosses respectively. For the Vex, complete the likes of The Pyramidion. For Cabal, try tree of Probabilities or The Arms Dealer. Once you’ve gathered enough resources, open the Gambit Director and enter the Mystery and Potential activity. You’re looking for a tape from The Drifter, so visit him again once you find it. He’ll send you back out to find more tapes in the EDZ. You can find them near computer consoles in Trostland, Skydock IV, Scavenger’s Den, Winding CoveFlooded Chasm, Soujourner’s Camp and Excavation Site XII. Once you’ve found them all, head back to see The Drifter. He’ll give you a Crew loyalty package for all your hard work. 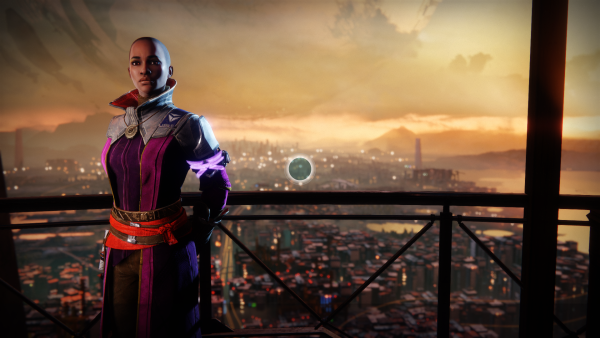 So you’ve decided to side with Zavala and the Vanguard – how noble of you! Your first job is to find a terminal in the Tower Hanger to compose an encrypted to Aunor Mahal, a member of the Praxic Order and member of The Hidden. Once that’s sent, you’ll need to search the Tower Hangar to find a Hidden agent and pass on your message. The agent wants you to spy on The Drifter, so you’ll need to search the Annex for suitable places to plan listening devices. Once you’ve done that, return to the Hangar terminal you used earlier to monitor the bugs you planted. You catch wind that The Drifter is on his way to see Spider in the Tangled Shore, so pop over to see him first. He’ll demand a large sum of Glimmer in exchange for ceasing his operations with The Drifter. He also gives you a tip-off, so head over to Titan complete a Heroic version of the Siren’s Song adventure. After this, you’ll be asked to spy on The Drifter again, so jump into Gambit or Gambit Prime and bank 50 Motes. Aunor will then say that she’s worried The Drifter’s fake Dredgens will clash with real Dredgens, so you’ll need to jump into the Crucible and defeat 25 Guardians. Next, pull up the Gambit Directory and enter Mystery and Potential and look for a clue – the tape from earlier. Once you’ve discovered the tape, head to the EDZ and search for the rest of the missing tapes. As before, you’re searching Trostland, Skydock IV, Scavenger’s Den, Winding CoveFlooded Chasm, Soujourner’s Camp and Excavation Site XII. 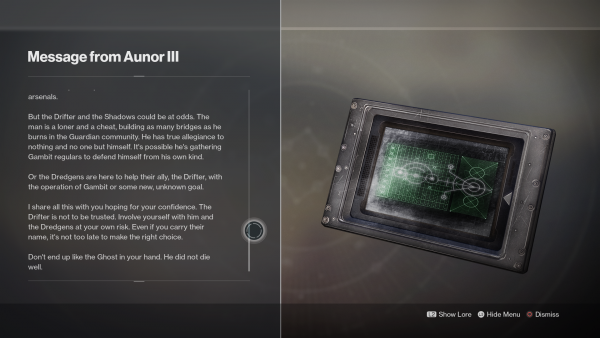 Once you’ve completed that, you’ll receive a message that was intended for The Drifter, so go and see him in the Annex – good luck. For siding with the Vanguard, you’ll get the Warlock Aunor Lore book and the Praxic Loyalty Package. And that’s it! You can check out our guides to see what Exotic and Pinnacle weapons are coming to Destiny 2, how to boost your power to 640 and our guides on Gambit Prime and The Reckoning. You’ll be able to visit Xur and begin the Invitations from the Nine activity this Friday and Tier 3 of The Reckoning will be available to play. For everything else, check out our Destiny 2: Forsaken guide.